Kids and adults can share a round of golf together. 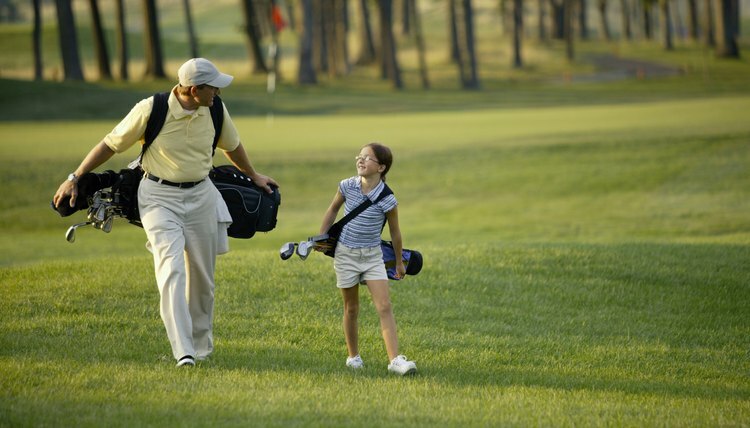 Children can enjoy golf because they see their moms and dads playing. They feel grown up that they're using the same clubs as adults. Children haven't yet been intimidated by the ball and consider golf a game, not a battle between themselves and the course. There are no special rules for kids' golf. The rules for adults apply. First and foremost, golf is a fun game, which adult players sometimes forget. Nothing is more enjoyable to a golfer than a summer day with 18 holes of freshly mowed fairways and manicured greens ahead. The sun is shining with perhaps just enough of a breeze to cool you off. Keep the experience positive for kids. Providing encouragement for children just starting out in the game is critical. The child needs to know what they have done correctly and not scolded on the course for what they've done wrong. Respect is an important part of the game of golf. Respect the course, the equipment and the other players. Kids are expected to behave themselves on the course with no pushing, shoving or loud noises. It's perfectly acceptable to celebrate a well-played shot but not with yelling and screaming. The golf course is a place to play but not a playground. Teach your child to stay quiet when other players are hitting the ball. It may seem funny to make a loud noise just when your playing partner is going for a birdie putt, but it's rude. Children should congratulate the other player for a well-played ball and never cheer or laugh at a bad shot. Just as you would expect a child playing soccer to wear proper shoes, shorts, tee shirt and shin guards, children are expected to dress properly for the golf course. Private clubs may have more stringent dress codes than public and municipal courses. If you're playing as a guest of a member, ask the member what the dress code is. Most courses require Bermuda length shorts or long pants and a shirt with a collar and sleeves. Girls may wear a skirt, which is a combination of shorts and skirt, shorts or long pants. Denim is frowned upon and isn't accepted at many courses. Children often play from the women's tees or the shortest men's tee so the length of the course is manageable for them. If a foursome of adults is catching up to the child--children usually play slower than adults--it's a courtesy to allow the foursome to play through so their game isn't delayed. Kids who are struggling and taking more than eight shots per hole may want to pick up after their tee shot and resume play near the green. This keeps them from getting flustered and frustrated and still allows them to hit various shots. Kids sometimes want to hop from hole to hole rather than playing them consecutively. That isn't allowed. Teach the child to rake the sand trap after a bunker shot is hit, replace divots and walk softly on the greens. Play Golf America: What are the Basics of Golf Etiquette?